Pick up from your hotel or residence in San Francisco at about 6:45 a.m.
From Merced 2 hours to Yosemite by large 45 foot motor coach (bus) seating up to 55 passengers, with a wash room. Suitable for Cedar Lodge and Yosemite View Lodge in El Portal. 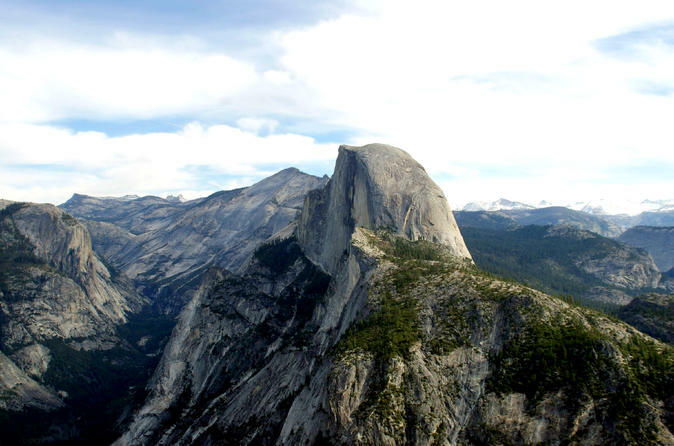 Ideal for Half Dome Village, The Majestic Yosemite Hotel, Yosemite Valley Lodge by The Falls and campsites. You can go one day and return on a different day. Detailed information including shuttle map, instructions and helpful hints provided by e-mail or with hard copies if you are picked up in San Francisco area. Going up in the morning a comfortable train ride from Oakland / Emeryville to Merced takes about 3 hours and then YARTS motor coach to Yosemite Valley takes about 2 hrs and 15 minutes. The distance between San Francisco and Yosemite is 215 miles (345 km). Driving time in a car is at least 4 hours, in a bus about 30 minutes more each way. Several tour companies operate sightseeing trips for the day that take at least 15 hours. Those using large 40 or 45 feet motor coaches seating up to 55 passengers have space for luggage. Others using mini busses or vans charge for the space taken up by your baggage if it cannot fit under the seat.